Note: this post first appeared on ZBW Mediatalk and has been updated to reflect the latest update of Open Knowledge Maps. Science and research are more productive than ever. Every year, around 2.5 million research articles are published, and counting. A lot of research information is openly available: thanks to the open access movement, we can now find more than 100 million scientific outputs on the web. We have made great strides with respect to accessibility; but what about discoverability? After all, this enormous amount of knowledge is only of use to us, if it reaches the people that need it, and if it is reused as a basis for further research or transferred to practice. Here we can see a big gap. Depending on the discipline 12% to 82% of all scientific publications are never cited. This means that these publications do not serve as a basis for further research. When talking about transfer to practice, the gap is even wider: even in application-oriented disciplines such as medicine, only a small percentage of research findings ever influence practice – and even if they do so, often with a considerable delay. What prevents knowledge transfer to practice? One reason for this situation is that the tools for exploration and discovery of scientific knowledge are seriously lacking. Most people use search engines for this task. Search engines work very well, when you know what you want. Then, they deliver the result you are looking for – often with high precision. However, if you want to get an overview of an unknown scientific field, the list-based representation with only 10 results per page is not sufficient. With search engines, it takes a long time, before you know the main areas in a field, the most important terms, authors and journals. It can take weeks if not months – indeed in many PhD programs, the whole first year is devoted to this process. Many people in research and especially practitioners do not have that much time. Think about science journalists or patients. To summarize: there are many people out there that could benefit from scientific knowledge, if there were better tools for discovering research results. At Open Knowledge Maps, we intend to close this gap, to provide the missing link between accessibility and discoverability. Instead of lists, we use knowledge maps for discovery. Knowledge Maps show the main areas of a field at a glance. Relevant publications are already attached to each area. This enables users to get a quick overview of a field. The sub-areas also make you aware of the terminology in a field. This information alone may take weeks to find out. How much time have you already lost to searching without knowing the best search terms? In addition, the knowledge map enables users to separate the wheat from the chaff with respect to their current information need. For an ambiguous search term for example, the different meanings are sorted into separate areas. At Open Knowledge Maps, we are offering an openly accessible service, which allows you to create a knowledge map for any search term. Users can choose between two databases: Bielefeld Academic Search Engine (BASE) with more than 110 million scientific documents from all disciplines, and PubMed, the large biomedical database with 26 million references. We use the 100 most relevant results for a search term as reported by the respective data base as a base for our knowledge maps. The ordination and the determination of the areas is based on textual similarity of the metadata of the results. This means: the more words two documents have in common in either title, abstract, authors or journal name, the closer they are positioned on the map and the more likely they are placed in the same area. For everyone who would like to dive deeper into the algorithms used to create the map, our article Open Knowledge Maps: Creating a Visual Interface to the World’s Scientific Knowledge Based on Natural Language Processing in the journal 027.7 is worth reading. The knowledge map for research “sugar” can be seen below. As described above, the bubbles represent the different areas. If you click on one of the bubbles, you are presented with papers related to this area. Open access articles are clearly marked and can be read within the interface. The idea is that you do not need to leave the browser tab while searching for literature. Go to Open Knowledge Maps to check out the search service. The “Open” in Open Knowledge Maps does not only stand for open access articles – we want to go the whole open science way and create a public good. This means that all of our software is developed open source. You can also find our development roadmap on Github and leave comments by opening an issue. The knowledge maps themselves are licensed under a Creative Commons Attribution license and can be freely shared and modified. We will also openly share the underlying data, for example as Linked Open Data. This way, we want to contribute to the open science ecosystem that our partners, including rOpenSci, ContentMine, Open Knowledge, the Internet Archive Labs and Wikimedia are creating. We see libraries as important collaboration partners. We cooperate with the libraries of the University of Bielefeld and the Austrian Academy of Sciences. ZBW is also using software from Open Knowledge Maps in a joint project with the Know-Center. This collaboration is a win for both sides: Open Knowledge Maps is a stable, user friendly system, which enables libraries to visualize their collections of documents and to improve their discoverability. On the other hand, improvements from these projects are fed back into the software of Open Knowledge Maps, improving the system for all users. We see libraries and librarians as central to this vision. A collaborative system cannot work without experts on knowledge curation and structuring. Together with the other stakeholders from research and society, including researchers, students, journalists, citizen scientists and many more, we want to create a system that enables us to create pathways through science for each other. So that we can all benefit from this unique knowledge. Note: this post was written in collaboration with Katja Mayer and first appeared on the F1000 Blog. 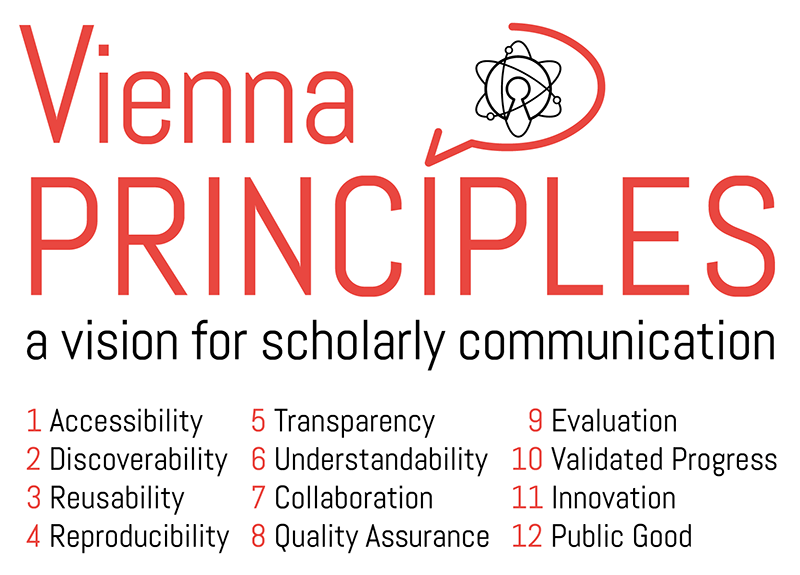 In June 2016, we published the Vienna Principles: A Vision for Scholarly Communication in the 21st Century. The set of twelve principles describes the visions and foundations of a scholarly communication system that is based on the notion of openness in science, including the social sciences and humanities. Open science demands the highest possible transparency, shareability and collaboration in knowledge production, as well as in the evaluation of scientific knowledge and impact. The principles are designed to offer a coherent frame of reference to the often controversial debates on how to improve the current system of scholarly communication. Mindful of the fact that systems of communication shape the very core of scientific knowledge production, we set out to envision guiding principles for scientific practice that we really want. In this post, we’d like to introduce the principles and provide context on how they came about. We’ll also share our ongoing work of turning the vision into practice. Our work started in Vienna during the spring of 2015, when the Open Access Network Austria (OANA) commissioned the working group “Open Access and Scholarly Communication” to sketch a vision of how open science can change scholarly communication in the long run. Over the year, we had five further meetings, each of them in a different Viennese location, hence the name “Vienna Principles”. The group consisted of a diverse set of people, including librarians, science administrators, students and researchers from a wide range of disciplines, including arts & humanities, engineering, natural sciences and social sciences in both basic and applied contexts. Many working group members are involved in related initiatives, such as Citizen Science Austria, Open Knowledge, Creative Commons and OpenAIRE, to name just a few, and several have a relevant professional background, including publishing and software development. The core group consisted of nine participants, but the overall work involved contributions and feedback by more than 20 people and the audiences of the 15th Annual STS Conference, Graz and the 3rd Plenary of the Open Access Network Austria. At the beginning, there were a number of observations that were based on our own involvement in open science, and by the experience of group members that had joined the movement only very recently. Our first observation was that open science is still a fuzzy concept for many. People are often either unclear about its benefits or are overwhelmed by the challenges that come with it. Therefore, they tend to have a reserved attitude towards openness. Our second observation was that the debate within the open science community is not necessarily focused on the benefits of openness, but mostly on what constitutes openness, how to achieve openness, and what steps to take next. The classic debate around the “green” and the “gold” route to open access is a good example for this. In these discussions, many of the arguments carry implicit assumptions about the structures of a future scholarly communication system, besides highly emotional debates about the commodification of scientific knowledge distribution. There are currently no commonly agreed set of principles that describes the system of open scholarly communication that we want to create. Such a collection of widely shared cornerstones of the scholarly communication system would help to better guide the debate around open science. At the same time, a vision is needed that better conveys the need for openness in scholarly communication to academia and society. For the definition of the principles, we adopted a clean slate approach. This means that we set out to describe the world that we would like to live in, if we had the chance to design it from scratch, without considering the restrictions and path dependencies of the current system. Our aim was to be clear, concise and as comprehensive as possible, without repeating ourselves. What followed was an intense phase, where we devised and revised, expanded and reduced, split and merged. We also addressed and incorporated the valuable feedback that we received by so many. From this, we established a set of twelve principles of scholarly communication describing the cornerstones of open scholarly communication. This is just the beginning, with this being version 1.0 and we invite everyone to comment on this version. Our paper has been positively received. Besides hundreds of tweets linking to the publication on Zenodo and newspapers and blogs have also reported about it. This includes articles that have been partially translated into Spanish, Japanese and German. The PDF on our website has been annotated 58 times alone. We are delighted that several researchers are now trying to adopt the principles in their research and collaboration projects. The working group, consists of 16 new active members, of which some are consolidating the latest feedback received in recent months, and others who are devising recommendations on turning each principle into reality. This allows us to study and discuss the different attitudes towards the twelve principles in a range of disciplines, especially in those fields which seem most sceptical about the principles, such as historical and art-related subjects. We will consider stakeholder’s viewpoints, clarify legal framework conditions, and discuss incentive and reward systems to identify how the principles can be best applied throughout the institutions. In doing so, we hope to be able to illustrate the best practises and identify any obstacles to open science in the scholarly communication system. We plan to hold group discussions and workshops with stakeholders, publisher and funders to explain how the principles could support the services they offer and articulate the capability of these principles to different stakeholders’ needs. Furthermore, we are coordinating our efforts with other groups, such as the Force11 working group on the Scholarly Commons and SPARC Europe. By 2018, we aim to have an updated version of the Vienna Principles and several recommendations to support the adoption of open science based on the feedback obtained from the workshops and discussion groups. We are looking forward to shaping the scholarly communication system of the future together with all of you. Note: This post originally appeared on the OpenAIRE blog on 22 June 2016. Last week, we published the Vienna Principles: A Vision for Scholarly Communication in the 21st Century. The announcement of the publication has been widely shared. In this contribution, I’d like to provide more context on how the principles came about – starting with the network that brought the authors together: the Open Access Network Austria (OANA). OANA was established in 2012 as a joint activity under the organisational umbrella of the Austrian Science Fund (FWF) and Universities Austria (UNIKO), and it has become a well-known entity in the world of open access. Its members were for example part of the negotiation team that led to the Austrian Springer deal. OANA is also the origin of the widely shared and well-received Recommendations for the Transition to Open Access in Austria, which call for the bulk of scholarly communication in Austria to be open access by 2025. In line with OANA’s mission, the document does not only propose objectives, but also defines a set of specific recommendations for the implementation of this goal. OANA is therefore an important driving force for making open access a reality in Austria. 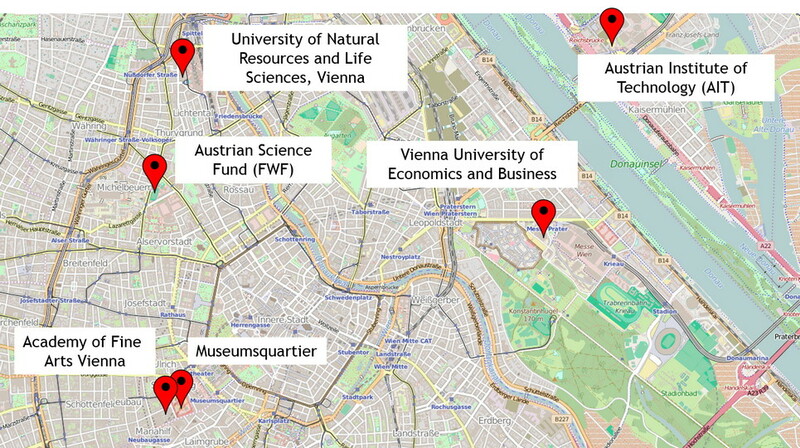 During OANA’s second assembly in 2015, Open Knowledge Austria brought forward a proposal to broaden the scope of the network beyond open access to explore various other instruments of open science. Based on this proposal, the OANA core team commissioned the working group “Open Access and Scholarly Communication” to sketch a vision of how open science can change scholarly communication in the long run. The working group first met in April 2015 in the Museumsquartier in Vienna. Over the following year, we had five further meetings, each of them in a different Viennese location – hence the name “Vienna Principles”. By scholarly communication we mean the processes of producing, reviewing, organising, disseminating and preserving scholarly knowledge (This definition is based on the definition found in Wikipedia [05 June 2016]). Scholarly communication does not only concern researchers, but also society at large, especially students, educators, policy makers, public administrators, funders, librarians, journalists, practitioners, publishers, public and private organisations, and interested citizens. As you can see from our working definition above, we have a broad understanding of scholarly communication, especially when it comes to its stakeholders. Our group reflected this diverse approach: it consisted of librarians, science administrators, students and researchers from a wide range of disciplines, including arts & humanities, engineering, natural sciences and social sciences in both basic and applied contexts. Many working group members are involved in related initiatives, such as Citizen Science Austria, Open Knowledge and OpenAIRE to name just a few, and several have a relevant professional background, including publishing and software development. The core group consisted of nine participants, but the overall work involved contributions and feedback by more than 20 people and the audiences of the 15th Annual STS Conference, Graz and the 3rd Plenary of the Open Access Network Austria. Our work started from a number of observations that were based on our own involvement in open science, and by the experience of members of the group that had joined the movement only very recently. The first of these observations was that for many, open science is still a fuzzy concept. People are often unclear about its benefits and therefore tend to have a reserved attitude towards openness. Our second observation was that the debate within the open science community is not necessarily focused on the benefits of openness, but mostly on what constitutes openness, how to achieve openness, and what steps to take next. The classic debate around the “green” and the “gold” route to open access is a good example for this. In these discussions, many of the arguments carry implicit assumptions about the structures of a future scholarly communication system. These observations led to a first round of input backed up by results from research into the subject, which included an analysis of the state of the debate in open access, a compilation of actors and actor groups within scholarly communication, benefits and issues of open science, and the deficits of the current scholarly communication system. We concluded that there is currently no commonly agreed set of principles that describes the system of open scholarly communication that we want to create. Such a collection of widely shared cornerstones of the scholarly communication system would, however, help to better guide the debate around open science. At the same time, a vision that answers the question “what for?” would help to better convey the need for openness in scholarly communication to academia and society. For the definition of the principles, we adopted a clean slate approach, as advocated for example by Cameron Neylon. This means that we set out to describe the world that we want to live in, if we had the chance to design it from scratch, without considering the restrictions and path dependencies of the current system. Our aim was to be clear, concise and as comprehensive as possible, without repeating ourselves. What followed was an intense phase, where we devised and revised, expanded and reduced, split and merged. We also addressed and incorporated the valuable feedback that we received by participants of the 15th Annual STS Conference in Graz and the 3rd Plenary of the Open Access Network Austria. So what’s next? The working group will continue its job in the next iteration of OANA, starting this fall. Consolidating the feedback will be an important part of our work, as well as staying on top of the developments in scholarly communication. But we we will also be busy to devise recommendations on how to turn each principle into reality, while coordinating our efforts with other groups such as the Force11 working group on the Scholarly Commons. We are looking forward to shaping the scholarly communication system of the future together with all of you!